Daniel Smith (L) and Michael Reyes as they appear in Mutt. In this election year, two Chicago theaters -- Stage Left and Red Tape -- are collaborating on a very political play. Mutt, a new play written by Christopher Chen, is described as a "blisteringly funny satire that skewers not only the elephants in the room but the donkeys too," as it "burns down the entire house of racial cards." 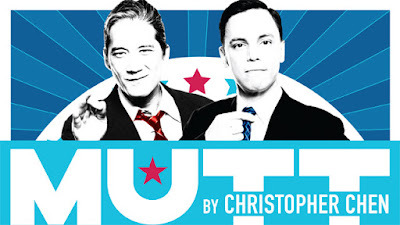 Mutt opened on stage at Theater Wit on January 9 and it runs till February 14. I am alerting you to the existence of this production of Mutt not because of its timeliness, although that's certainly a big plus, but because of its central Illinois connections. Director Vanessa Stalling is someone I met in the masters' program at Illinois State University when she was finishing up her MFA in directing there, while Dan Smith, who plays the candidate on the left in the Mutt poster above, frequently appeared on stage at the Station Theatre in Urbana before he left for Chicago. He also happened to be in an acting class I once took in Champaign. That may not seem like much of a coincidence, but the classes I shared with Vanessa and Dan were more than 20 years apart, so it seemed striking to me. As for Dan Smith... In the early 90s, he played a variety of major roles at the Station in shows ranging from Tennessee Williams' The Night of the Iguana to Arthur Miller's Death of a Salesman, Craig Lucas's Reckless, Eric Overmyer's In Perpetuity Throughout the Universe and Terrence McNally's The Lisbon Traviata. He showed again and again that he can be compelling and charismatic no matter who he's playing. In Chicago, Dan has appeared at the Goodman (King of the Yees, Measure for Measure and The World of Extreme Happiness) as well as Victory Gardens (Never the Sinner), the Piven Theatre Workshop ( and Steppenwolf, where he created a role in Tina Landau's Space and traveled with the show when it moved to the Public Theatre in New York. Dan's role in Mutt is Len Smith, which already sounds like it fits. As you can see in this teaser video, Len is "exciting and non-threatening at the same time" as well as "a mix of every major race in the world." He's a multi-racial war hero who looks like the perfect candidate for canny political operatives looking to score a presidential home run. You can see a lot more about Mutt at both the Stage Left and Red Tape sites as well as on their Facebook pages and Stage Left's Youtube channel.